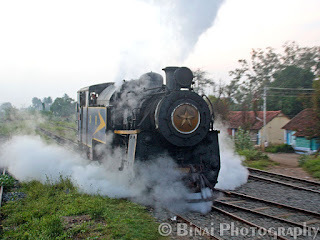 Back in the mid 1990s, I vaguely remembering asking my dad if we could return from Ooty by train - the option was shot down since the train is too slow, and runs on steam (yeah! that was a reason i was told). Some 17 years down the line, I was browsing the Indian Railways website looking for tickets to Ooty. I was looking at the date when the ticket was next available. This was in the first week of November - it turned out that the next available journey was on December 18, 2011. I called up Jayasankar and put this plan across - he was as much excited as I was. The booking went through after about 4 failed attempts - thanks to the super-computers at IRCTC. The journey was still more than a month away - the mandatory approval process at home took some time. Meanwhile, I got busy with works at my college. It was project submission time, and I was running behind my guide to get my work approved. Days flew past, and it was mid-December quickly. Project pressure was the highest at this point, and the trip looked very doubtful at this point - the only saving grace was that December 18 was a Sunday. 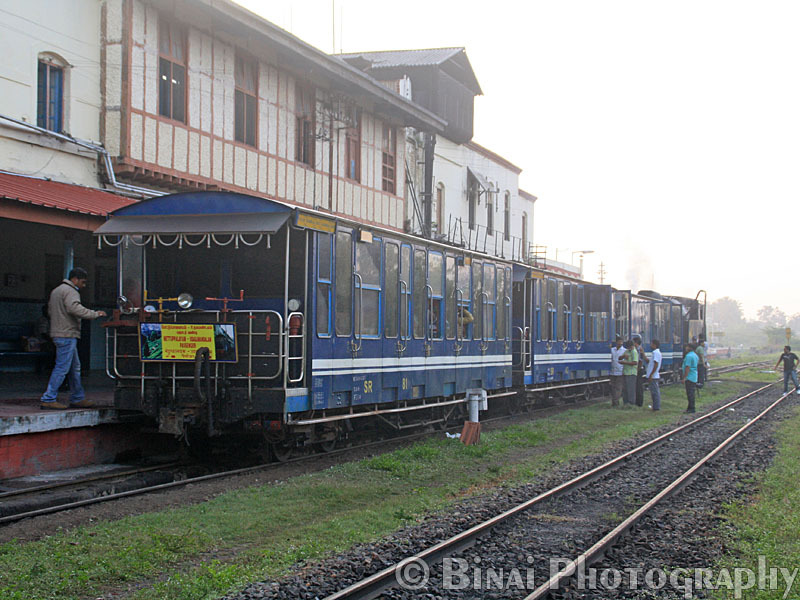 Jayasankar took a train from Trivandrum to Coimbatore - I was still sitting in College, as Jay passed Ernakulam. I reached home past 2, and quickly rushed to Thrissur. 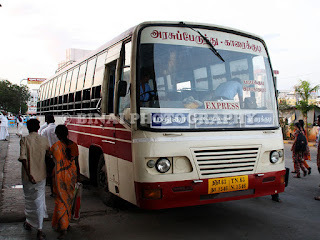 Changed a few buses to reach to Coimbatore (that warrants a separate post). Excitement levels were at the highest point on December 17th night. While I managed a couple of hours' sleep, I guess Jay did not hit the bed at all. 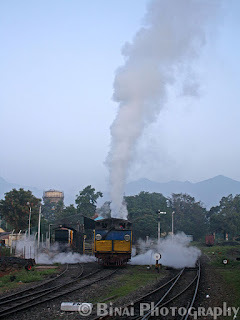 We were put up at a hotel right outside Coimbatore Junction Railway station - we reached the station at around 0430 in the morning. Queue at the ticket counter was already too long at this hour - a good majority of the people were students heading to their hometowns for Christmas/New Year vacations. It took us about 15 minutes to get a ticket. 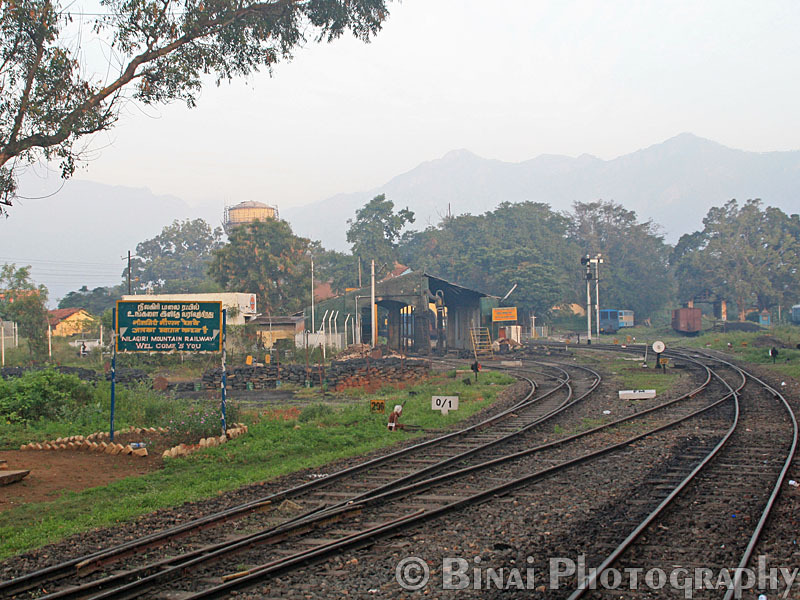 Our train to Mettupalayam was already on Platform 3 - that was the Chennai-Coimbatore-Mettupalayam Nilgiri Express. It was one really long walk from the subway to the loco - in fact, one has to walk almost 95% the length of the train to reach the loco from the subway. 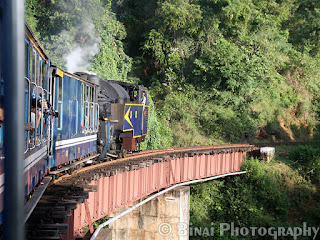 By now, the coaches to Mettupalayam were detached from the rest of the rake, and the new loco had already taken charge. It was one WDM2 from Erode that was working our train to Mettupalayam. We took the general coach closer to the loco - there were no seats around. We decided to door plate. The train left perfectly on time - 0515hrs. 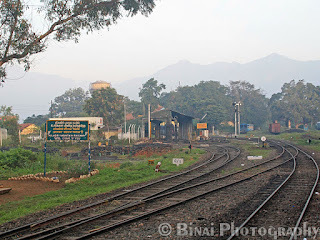 The 36kms stretch from Coimbatore to Mettupalayam takes about 45 minutes - we were at MTP by 0600hrs. It was still dark as we reached MTP. We were welcomed to MTP by an X-class Oil fired loco, preparing for its long run up the ghat. The loco was steaming up, and it was one amazing sight - a sight that would excite any traveler. That was something I cannot express in words. We spent time trying to capture that heavenly moment on our cameras..
Not the heavenly scene.. this is our "X-Class" oil-fired steamer getting ready for its day.. The next program on our cards was breakfast - Mettupalayam has one very good vegetarian refreshment room. They serve some really good food - the canteen works from 5 am to about 7 am and again in the evening. After an amazing breakfast, we were out photographing the celestial scene - the loco steaming up! It slowly dawned - with more light coming in, our cameras starting clicking at higher speeds. 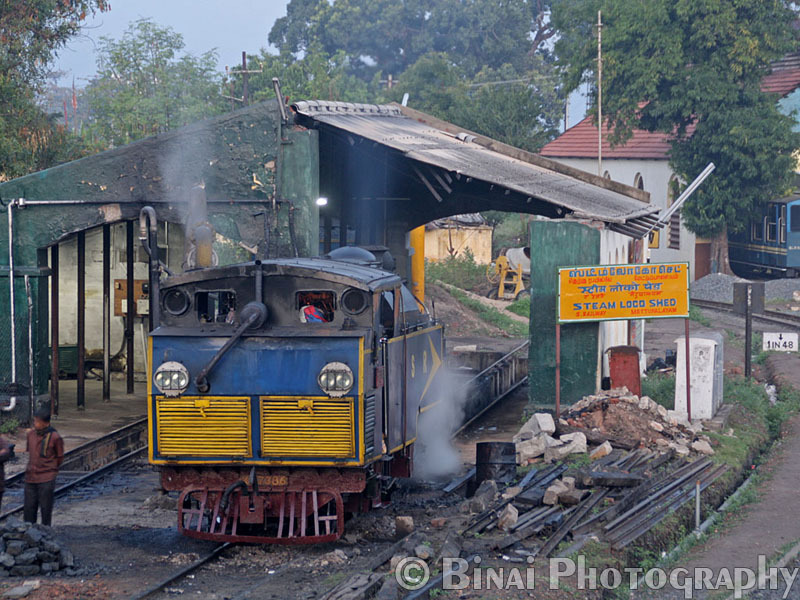 The loco - X-37386 - was brought out from the loco shed, and coupled to the rake at 0633hrs. 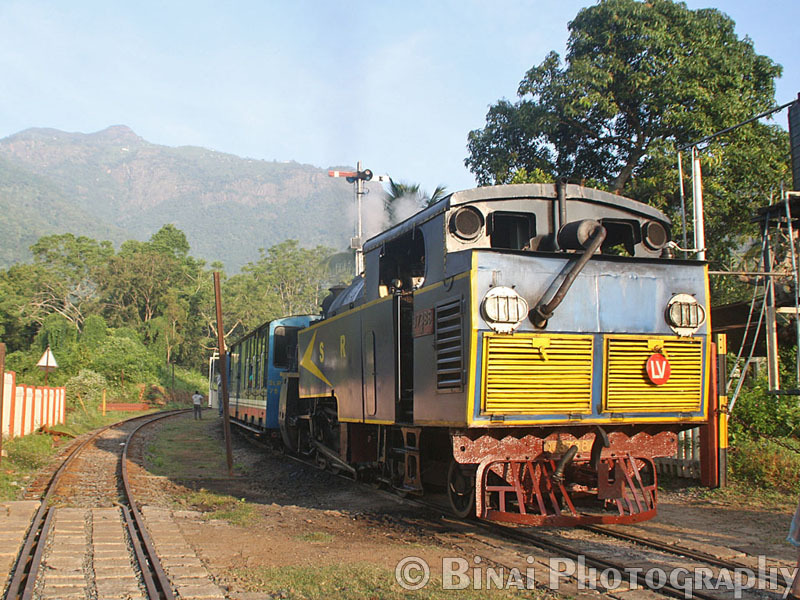 The train, 56136 Mettupalayam Udaghamandalam "Nilgiri" Passenger, departs at 0710hrs from there. While the loco was being coupled to the train, I had a quick chat with the LP - who also turned out to be a Malayalee, hailing from Kozhikode. 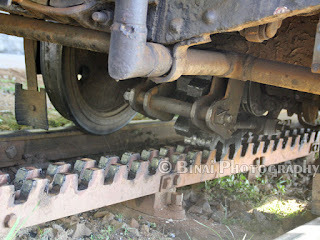 He confirmed that it was an Oil-fired loco - he was all praise for the original coal-fired locos. 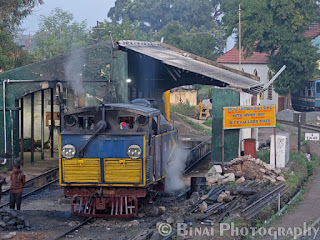 The loco steams its way out of the loco shed..
She reversed and came in to take charge of our train.. 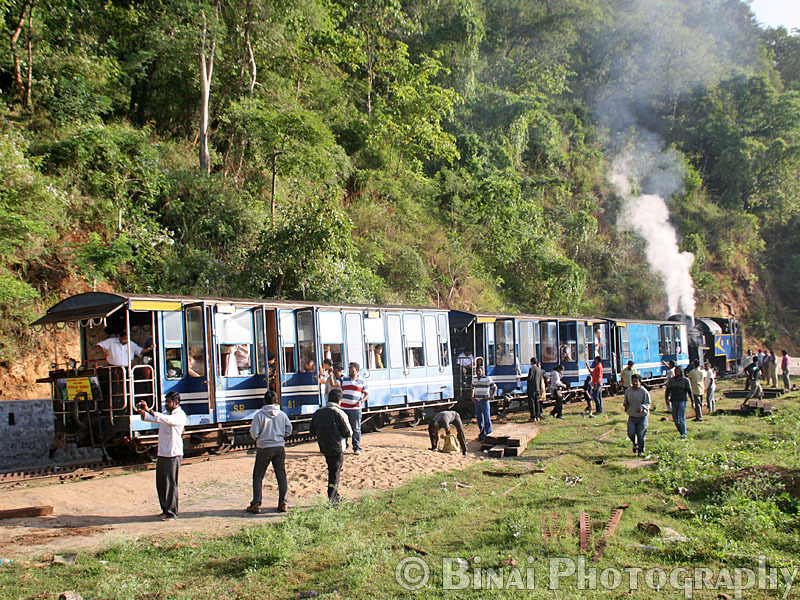 The train has all of three coaches - one FC/2S coach, one 2S coach and one SLR. The lead coach is the FC/2S coach. The FC portion has two "coupes" - each coupe seats 8 passengers - 4 in a row, in two rows. Passengers face each other. The 2S coupes seat 10 passengers each. Unreserved coaches are sold in limited numbers, and only enough tickets to fill the seating capacity of the coach is sold. There is no overcrowding in this train - boarding for unreserved passengers is strictly by queue. The train started off sharp at 0710hrs. It was one thrilling moment as the train slowly pushed the train out of the station - the motion is pulsating, and is not smooth as in normal trains. 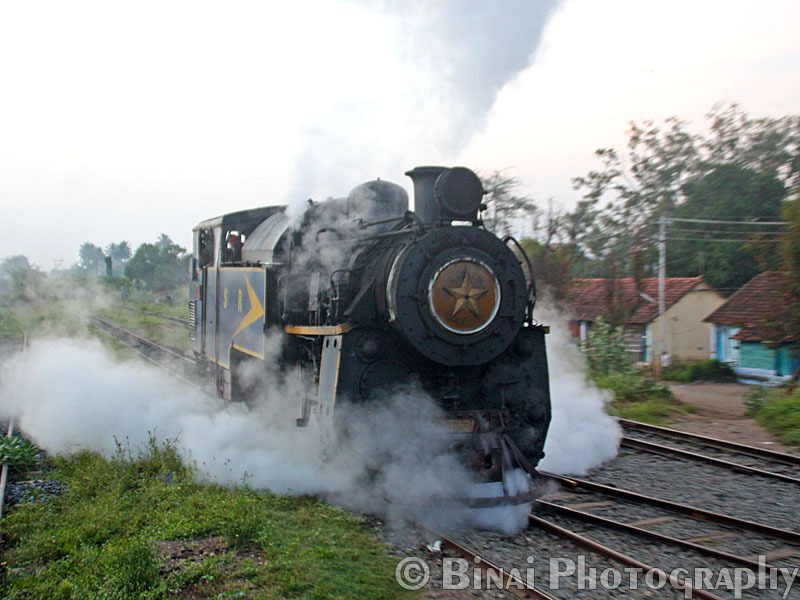 The run from Mettupalayalam to Kallar was uneventful - it passes through a typical Tamil Nadu countryside. 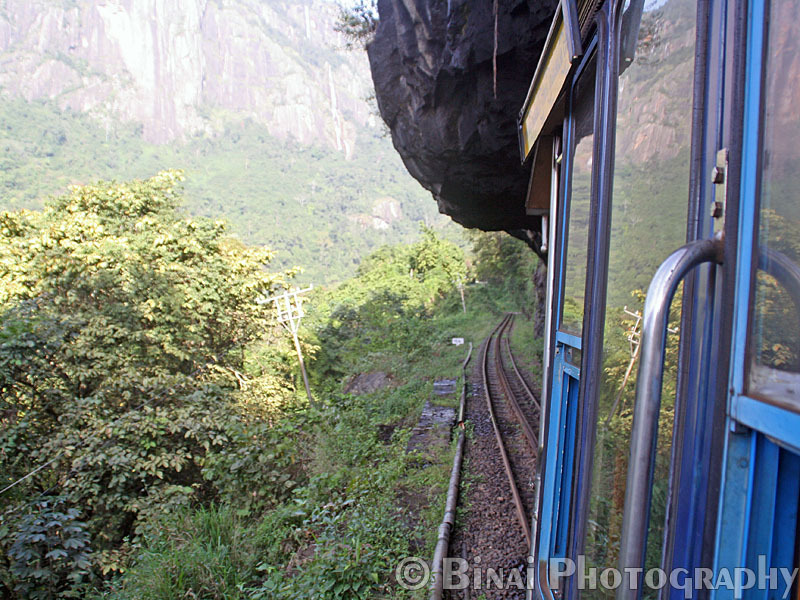 As the train nears Kallar, the majestic Western Ghats get clearly visible. 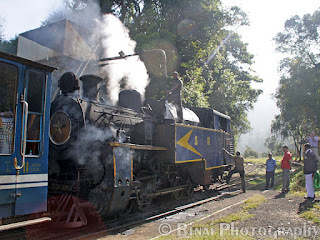 The line to Ooty curves around the loco shed, and climbs the ghats seen in the back ground..
Our rake getting ready for the ride.. Its a 3-coach affair. Our train took a break at Kallar - the break was about 5 minutes long. The loco was watered here. The doors of the coaches can be opened only from outside - one has to put his hand out of the window to reach the lock and open the coach.The design of the coach was awful - the windows were dirty, and the coaches were very congested. The train takes a royal 5 hours to reach Ooty (Udaghamandalam) - still the seating in FC is cramped. Legspace is too narrow. 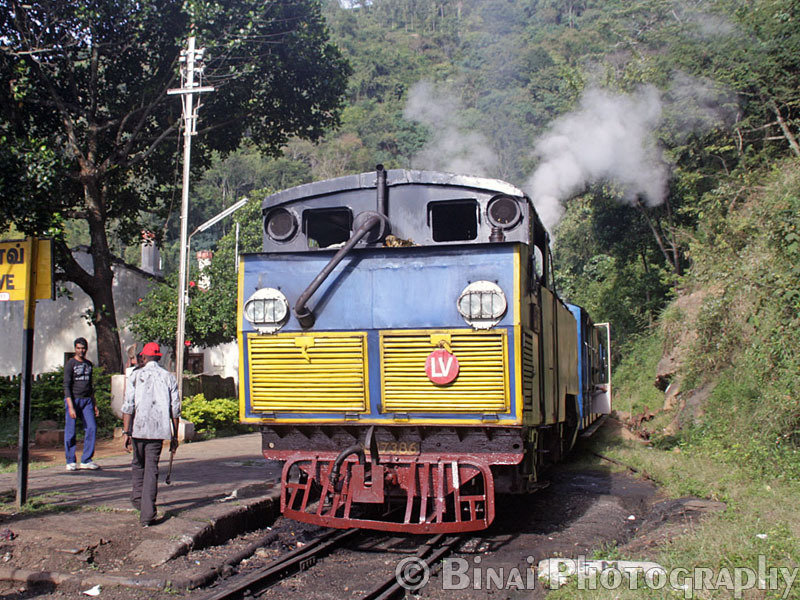 Since the loco is at the rear end, the guard sitting at the front is responsible to check signals and also warn people who may be on the track. For the purpose, a battery operated horn is provided. Power for lighting in the coaches is taken from batteries installed in the coaches. Since the train runs very slow, these batteries are charged at the base station. Meanwhile, we started off from Kallar. 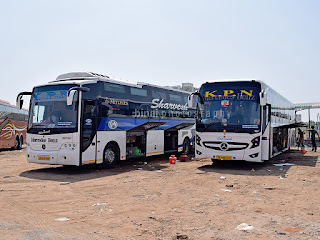 The rack-and-pinon section begins soon after Kallar - the ride quality changes after this. The pulse feeling gets stronger - one gets a feeling of the train going up step-by-step. The ride is similar to riding a horse - it goes dhak dhak. The gradients in the section are scary - the track goes through what can be called a proper forest. The train takes about 3 hours and 20 minutes to cover the 28kms from Mettupalayam to Coonoor, running at a royal speed of 8.4kmph! The train makes a stop every 45-60 minutes for watering (i.e., about once every 3-5 kms). After Kallar, the trains stops at Adderly (this station has no boards). There were no staff at this station - just a gangmen hut, and a person to handle watering. 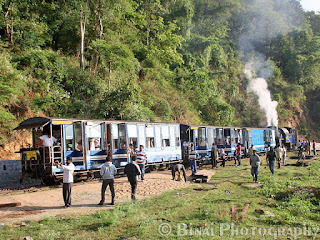 Each halt is about 15-20 minute long - people can stretch out a bit, and of course, take photographs! After Adderly, the train stops at Hillgrove - this is an official stop. This station has a station master, and a refreshment stall. This stop also serves a refreshment break for passengers. The halt at this station is longer than the other watering halts. After Hillgrove, the train stops at Runneymede - this is also a watering halt. 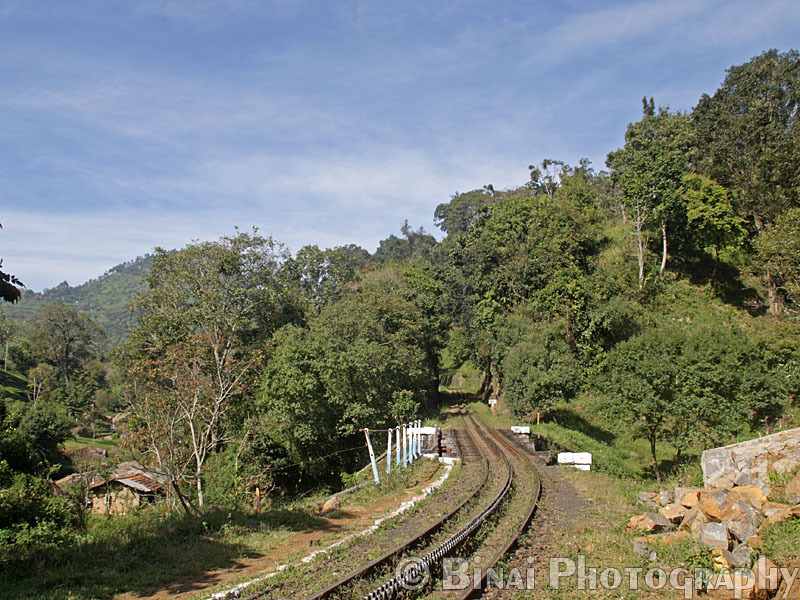 This station overlooks a valley - the otherside of which has a beautiful tea estate. There is a very visible sharp gradient at the end of this station. It is a painfully slow run after Runneymede - the next halt after this is Coonoor (ONR). Coonoor is the first proper railway station that one sees after Mettupalayam. Steam power gives way to a YDM4 here. The halt at Coonoor too is pretty long - very long, in fact. The section from MTP to ONR is very scenic - but the slow speed might put off the excitement - since the scenery might get monotonous - never for a railfan though. The Rack-and-pinon mechanism.. this is in its engaged state. These are the racks.. they run at the centre of the track all the way. Each coach has a pinon wheel. Our loco being watered at Hillgrove..
Two additional coaches were added at ONR - the coaches were shunted in by YDM4 #6724. Later, this loco was replaced with YDM4 #6399. Coonoor has a big loco shed (Steam as well as diesel) and a fairly big coaching depot as well. The run from ONR to UAM (Udaghamandanam) is uneventful - it goes through typical hillside townships. Although this section does not have rack-and-pinon, the gradients are fairly steep enough. The YDM4 runs faster than the X-class, but the journey is still slow. The last 18kms from ONR to UAM takes an hour and 20 minutes, stopping at 4 intermediate stations. The gradient out of Runneymade.. its a 1 in 22 up grade.. I had a brief nap after ONR. The lack of sleep the previous day was having a toll on me (Jay was already fast asleep by now). Thankfully, no body got off in any of the intermediate stations - so we did not have to open the door, or adjust for the people to get off. 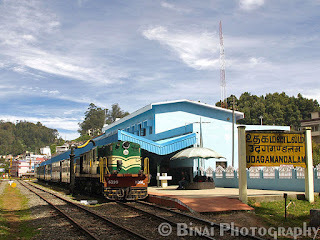 The train finally pulled into Udaghamandalam (UAM) at 1150 - early by 10 minutes. 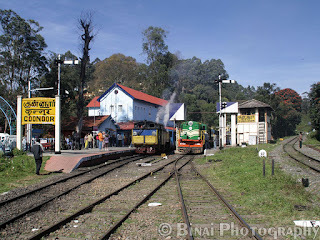 A huge crowd was awaiting the arrival of this train - this train returns immediately as Ooty-Coonoor passenger. There were cops everywhere - but they did not stop people from taking photographs. There ended our 5 hour long dream run - it was indeed a dream run! A life-time experience. 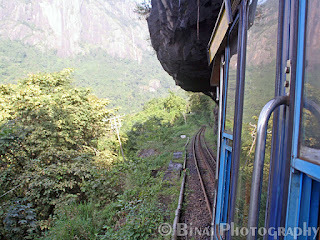 As our journey ended in Udagamandalam.. 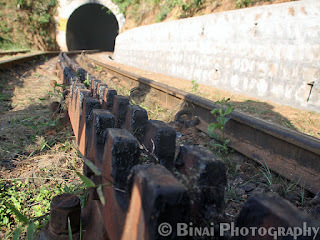 This trip is a must-do for all railfans - this would perhaps be the only metre gauge section that the future generation would see. The YDM4s would stay on for some more time, thanks to this section. This railway line is, no doubt, an architectural marvel. The staff on this route were very friendly - answering every question I had bombarded. Although the run is slow, one would enjoy it for the scenic beauty and the cool climate. 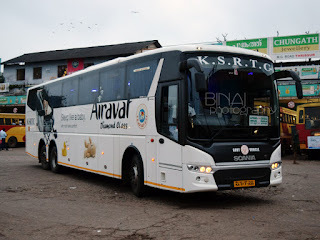 After seeing your Ooty buses album, i thought you have taken a NMR journey and we planned it in the same way as you did. Coimbatore to MTP in Nilgiri Exp and then from there its MTP-UAM Passenger. Still we couldnt able to write a post on it. Initially two planned and finally 5 made up for the journey. One of the life time experience we had. Thanks for the wonderful article. Hi Binai, Thanks for the good interesting read of your trip MTP UAM. Can you explain the breaking system in the NMR. What does the yellow lever and the red lever on each coach does and any technical details. Thanks, Shajan.